The British Basketball League (BBL) have teamed with basketballscotland to offer all of their members an exclusive opportunity to purchase discounted tickets for one of the biggest events in the UK basketball calendar – the British Trophy Finals. 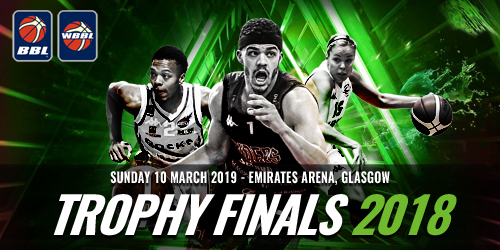 On Sunday 10th March 2019, the Emirates Arena in Glasgow will play host to both the BBL and WBBL Trophy Finals in what is sure to be yet another spectacular double-bill. With tickets in high demand as we approach the upcoming semi-finals, we recommend booking now to ensure the best possible price and location for your seats. To take advantage of the exclusive discount contact your club administrator. For the ultimate experience why not try out Courtside Tickets and receive entry to the VIP Lounge, exclusive game preview with a BBL Coach and some complimentary food – email clare@bbl.org.uk for further details. Be a part of it – don’t miss one of the biggest events in British basketball, book your tickets today and get ‘closer to the action’.